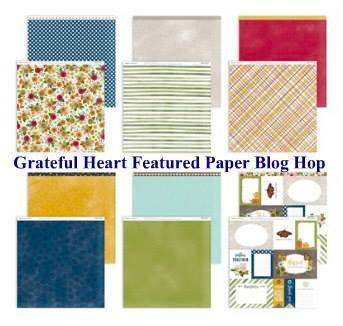 It is time for the Grateful Heart featured paper pack blog hop are you ready to be FALL inspired. If you have hopped from Kathleen's blog you are on the right track! My project this month share the beauty of our Craft With Heart, so easy peasy to create!! I have not added the photos as this is ready for 2018 Thanksgiving photos. The Craft With Heart has a subscription for all, monthly, quarterly or annually. With the monthly you will receive two double page layouts featuring the paper collection for that month. The quarterly will come every four months with eight double page layouts, two for each month. And the annual subscription, the best bargain for the price with FREE shipping plus 30 free prints from Persnickty Prints, gives you the 8 double page layouts every four months. Thank you for stopping by! If you see something you like ask your consultant, if you don't have a Close To My Heart consultant, I would love to serve you. Find out more on the Craft With Heart subscription by clicking here! Now to hop on over to see what Grateful Heart inspired creation Haley has in store for you. Beautiful layout! Love those butterflies! Beautiful! I can't wait to make mine! Shirley I love your layout! Those butterflies look so beautiful!